After two days of Save Constitution dharna followed by a tussle between CBI Officials and Kolkata Police, West Bengal Chief Minister Mamata Banerjee finally called off this in Kolkata as the Supreme Court asked the CBI not to arrest Kolkata police commissioner Rajeev Kumar on Tuesday. However the top court asked the top cop to cooperate with the CBI in the investigation. Lashing out at the Centre, the TMC chief said that it wants to control all the agencies. She also asked prime minister Narendra Modi to resign. “They (Central govt) want to control all the agencies including the state agencies also? PM you resign from Delhi and go back to Gujarat. One man govt, one party government is there,” ANI quoted Banerjee as saying. Banerjee had sat on dharna on Sunday hours after a team of CBI officers reached Rajeev Kumar’s house to arrest him for interrogating in chit fund scams case. Accusing the BJP of “blackmailing” people by misusing CBI, Banerjee said she has “great respect” for the probe agency and urged it to speed up its probe into theft of the Nobel medal of Rabindranath Tagore with the same alacrity with which, she alleged, the agency executes the orders of Prime Minister Narendra Modi and BJP national president Amit Shah. The protests by Banerjee was supported by many opposition leaders who also hit out at the Modi government for “misuse of CBI”. RJD leader Tejashwi Yadav and TDP chief Chandrababu Naidu joined Banerjee’s protests on Tuesday evening. 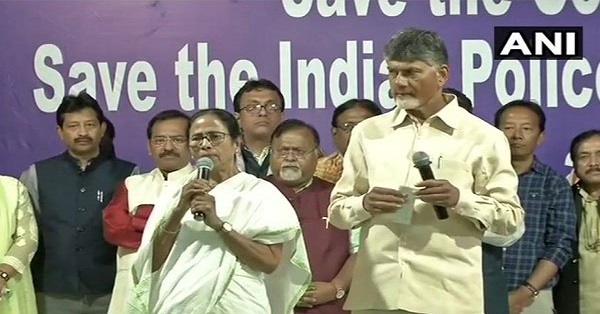 Naidu, who joined Banerjee’s “Save India” sit-in, said her party will win all 42 Lok Sabha seats in West Bengal in the upcoming general elections. “She (Mamata Banerjee) is the architect of the federal front. She is the main pillar of the opposition,” Naidu told reporters. Delhi Chief Minister congratulated Mamata Banerjee on Supreme Court’s order. Parliamentary proceedings have also been disrupted by opposition parties, including the TMC, SP and Congress over alleged misuse of the CBI in West Bengal.